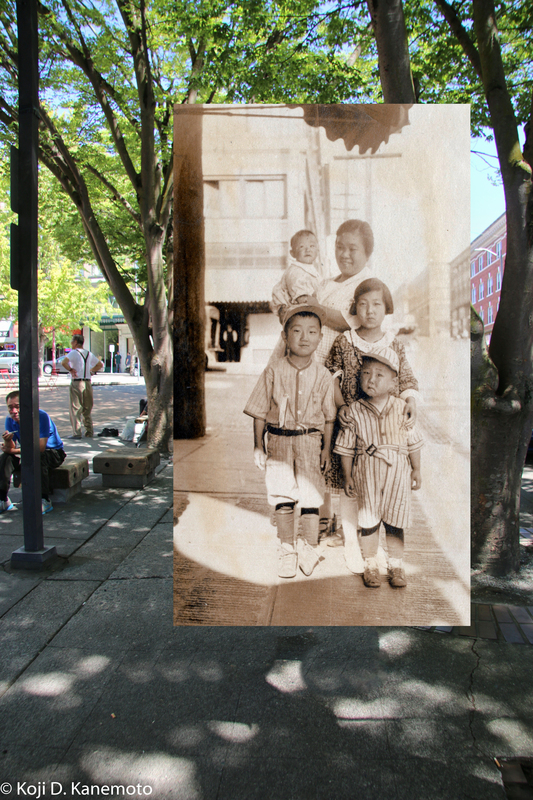 Grandfather Hisakichi and Grandmother Kono posing in Seattle with their first child, my Uncle Yutaka, in 1910. My grandfather, Hisakichi Kanemoto, immigrated from Hiroshima in 1898 with my grandmother Kono coming in 1908 to become his picture bride. They had seven children of which my dad is the last surviving sibling at 96 years of age. 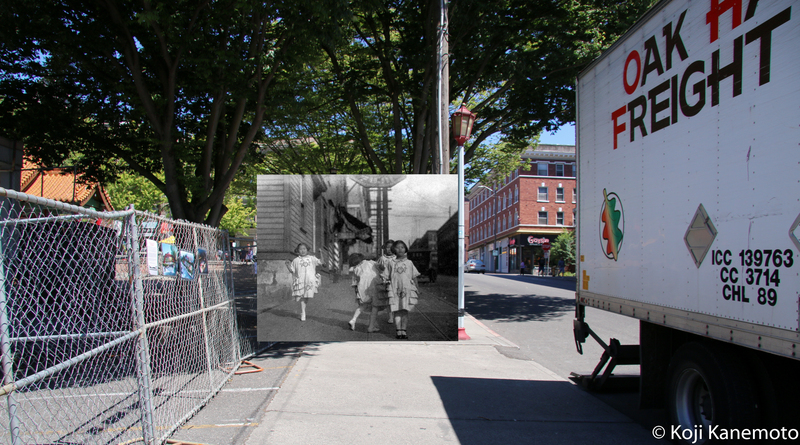 Five of those children called “Hotel Fujii” their home at King and Maynard in Seattle, WA. Sadly, Hotel Fujii is no longer standing. 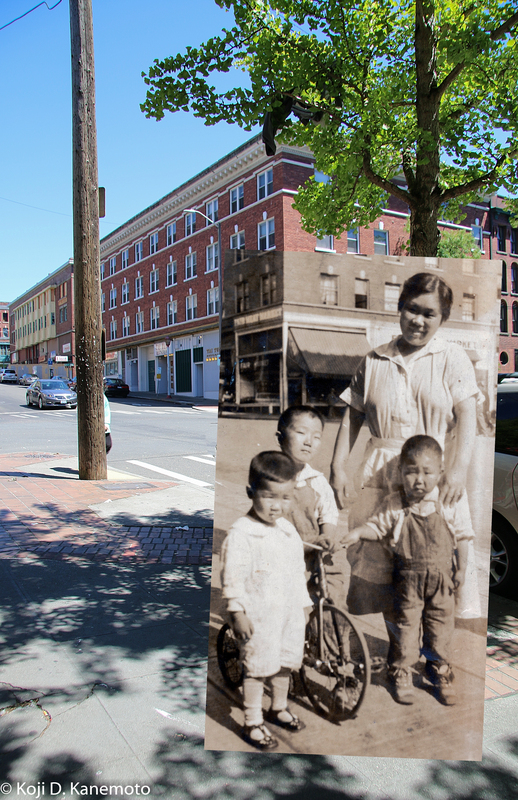 (Clockwise) Grandmother Kono, Uncle Suetaro, an unknown girl and dad on tricycle. Dad says the corner brick building had a butcher shop at street level. Circa 1925. 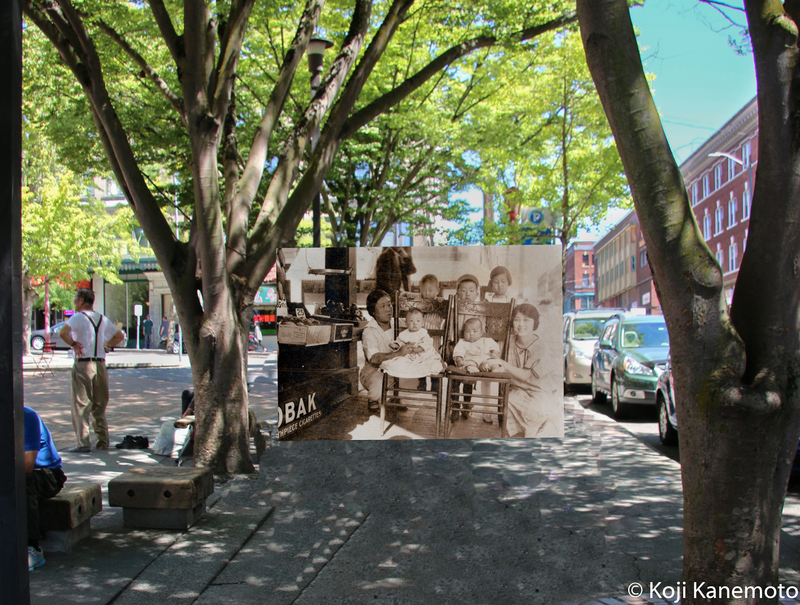 Color image taken at King and Maynard, June 25, 2015. Looking east up King Street. You can see the “Hotel Fujii” signage extending out from the hotel above my Grandmother. Year unknown but post 1917. At King and Maynard. 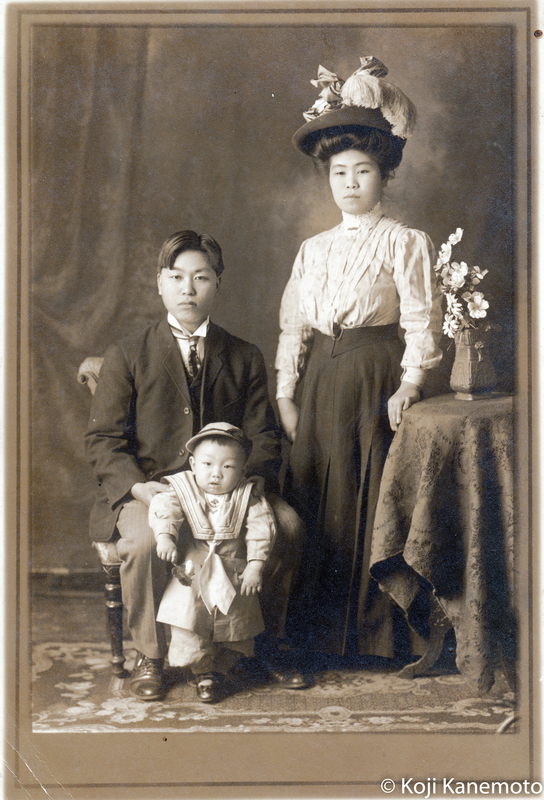 Clockwise from Grandmother: Aunt Shiz, Uncle Suetaro, Dad and baby Mieko. 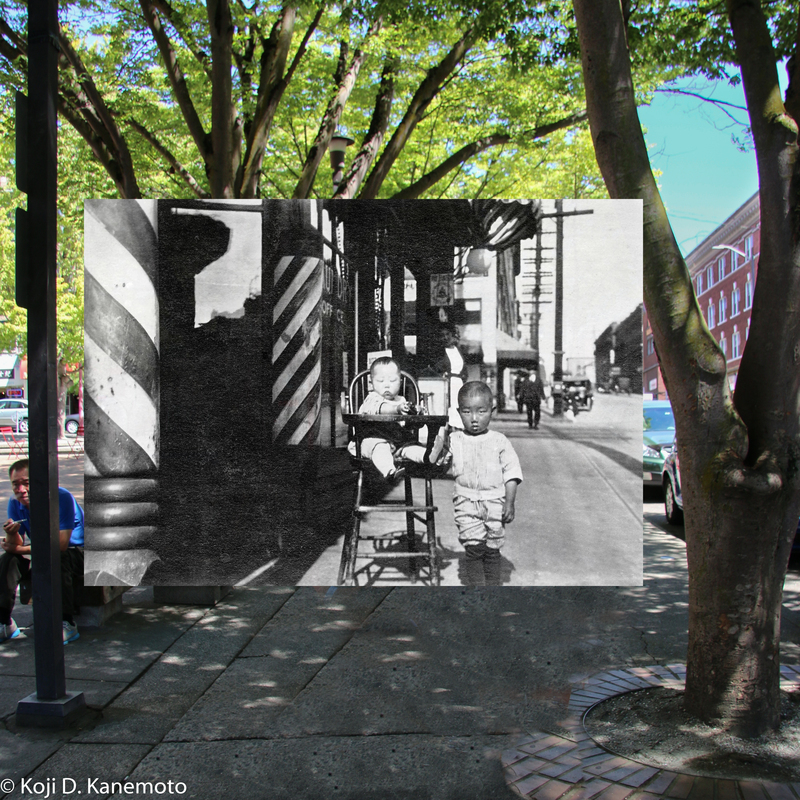 Based on baby Mieko, likely 1925. Grandfather Hisakichi at far right, taken at Mt. 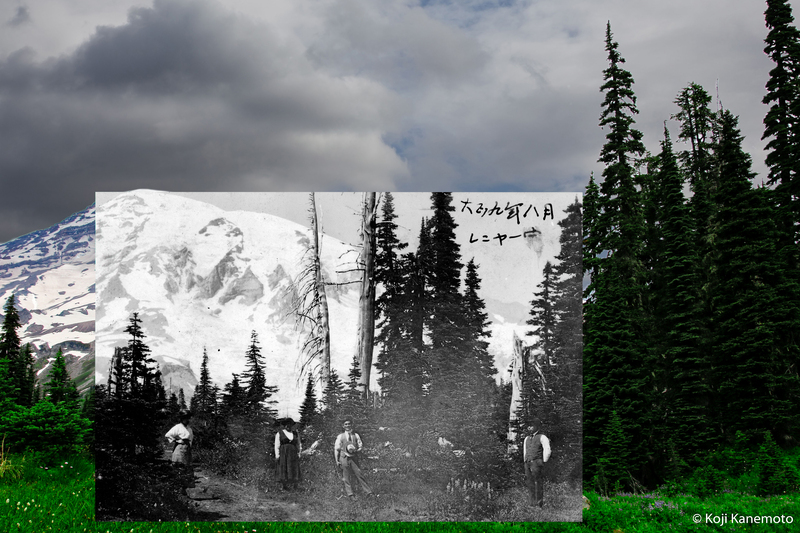 Rainier August 1919. Finding a similar location on Mt. 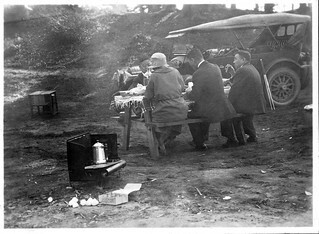 Rainier was a long shot but I had hoped this location in 1919 would not be far from current road stops as they were traveling in a 1913 Chevrolet Classic Six (Note 1). The 2015 color shot was a few hundred yards from the Rainier Inn. Aunt Shiz dancing on left, looking east up King Street. The bottom of the Hotel Fujii signage is above the girls. My guess is circa 1923. Grandmother Kono holding baby Mieko. Uncle Suetaro is peeking over the chair looking at his sister. Dad is standing in the middle with Aunt Shiz to his right. 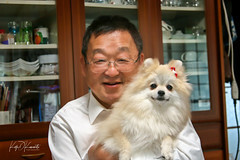 The lady is unknown as is the child but we suspect it is Mrs. Fujii. 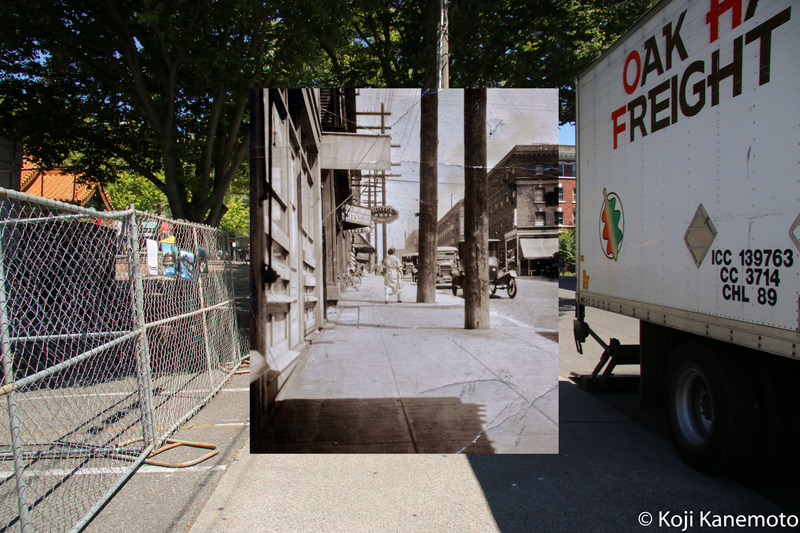 King and Maynard, circa 1923. Dad and Uncle Suetaro in front of Grandfather’s barbershop. Circa 1922, King and Maynard. Although a poor recreation, Grandfather is standing at right with his hand on an unnamed male buddy. He is in other photos. Taken at the entrance to Grandfather’s barbershop (best guess as to location). Circa 1917. Other very successful “then and now” recreations by professionals primarily had one thing in their backgrounds that I did not: a building. I overlooked that fact. 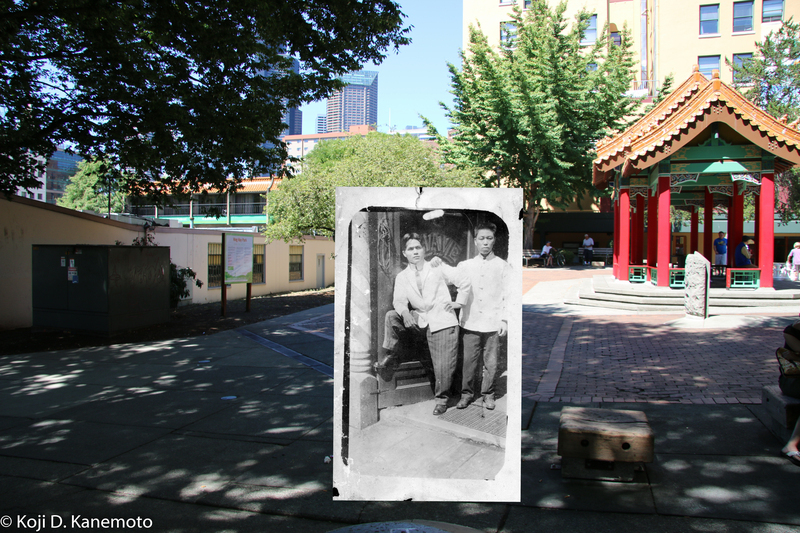 The Fujii Hotel was torn down with only a park left in its place, e.g., there were no windows or doors to line up the old photos with. For the most part, that made for difficulty in guessing/placing from where the photos from the mid-1910s to the 1920s were taken. I did not consider the fact that the buildings on this street 100 years ago were built on a hill, i.e., all were built upon a concrete base that was taller at the west end compared to the east end. Because of the number of cars parked curbside, I had to resort to wide angle shots. By doing so, perspective in comparison to the original would not be correct. There were a few homeless at the park who clearly did not want their picture taken. As my two kids were with me, that became a hurdle. I did not take into account the time of day (shade). I did not anticipate the construction nor the large trucks, garbage cans and trees blocking the view. I misjudged the position from where I took the photographs, affecting perspective and angle. I should have been ten more yards east for a few of the images. Too late now. 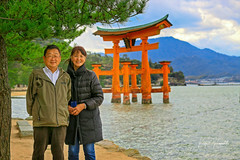 I also realized that there were no pictures of Uncle Yutaka nor Aunt Michie at the Hotel Fujii. Uncle Yutaka had likely already been in Japan (1913) by the time these old family photos were taken. Aunt Michie, of course, was the only sibling not born in Seattle but rather in Hiroshima. 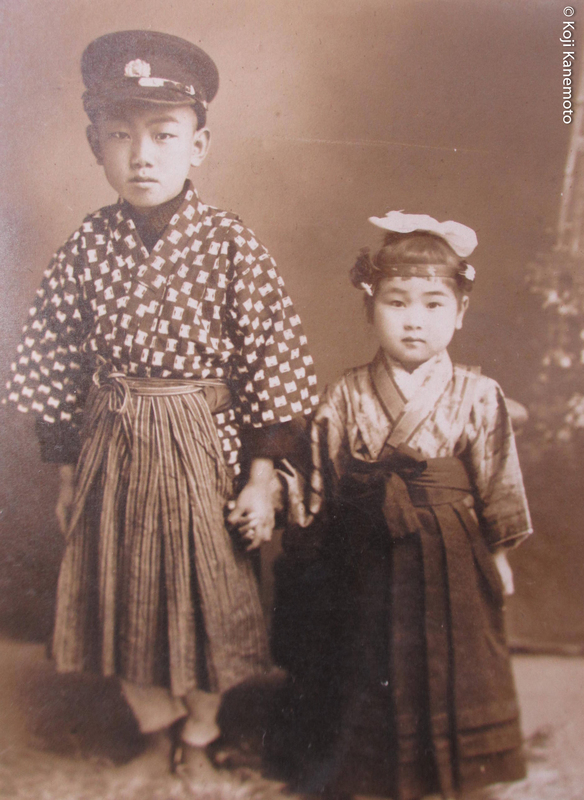 Uncle Yutaka and Aunt Michie, taken circa 1918 in Hiroshima. I only wish I had gained the experience before undertaking this family project. I do hope my cousins and children will still find these images interesting if not to merely appreciate our family photos from “100 years ago”. 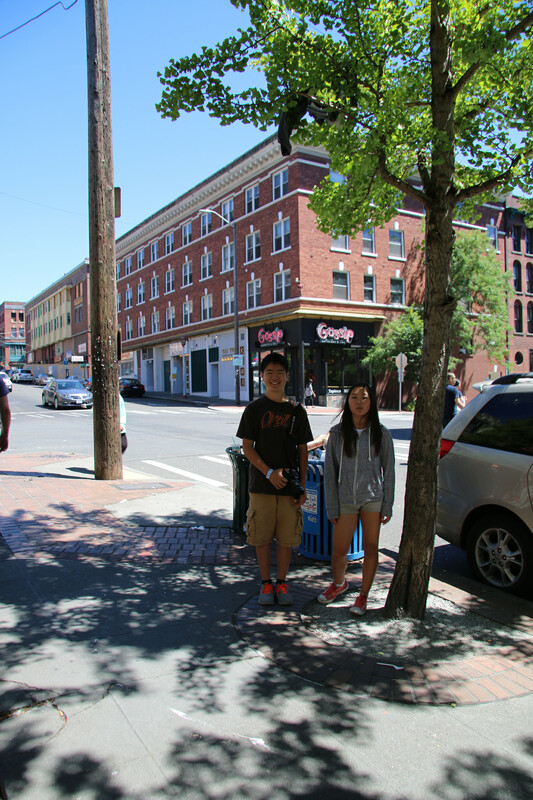 The current store “Gossip” behind my kids was a butcher shop in the 1910s/1920s per my father. 3. The northeast corner of King and Maynard, taken June 25, 2015. The building still stands as it was 100 years ago. 4. 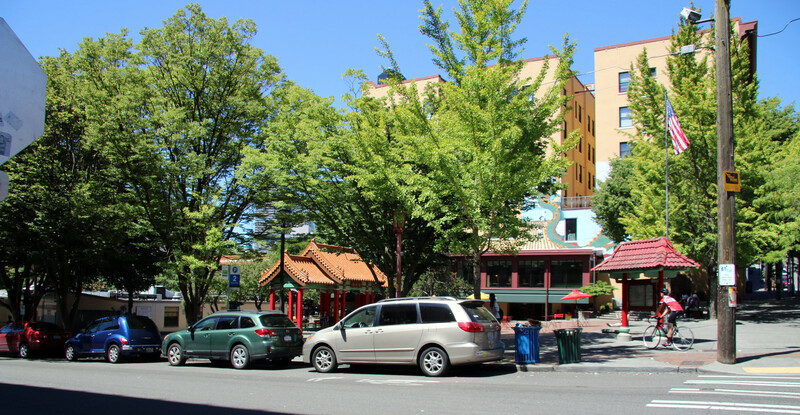 Hing Hay Park where Hotel Fujii once stood; taken from across the street. My guess is the barbershop entrance was behind the green car. At the corner was a small grocery store. To its left was Hotel Fujii. Taken June 25, 2015. You never cease to amaze me, Koji-san. I really enjoyed this. That makes me happy, sir. Thank you. Don’t beat yourself about over technical shortcomings; your photos are cool and a great record for the future. But more importantly you’ve shared your family’s past with your kids in a really hands-on fun way. Major success I’d say! I know what you mean! I tried to do something similar a few months ago — not with family photos, but a series of street shots that I happened to find while I was visiting the city where they were taken. For me it was a great way to find my way around a new place, but I had the same frustrations of parked cars, traffic lights, cranes and horrble new-builds that “ruined” my shots. Bet the kids had a great time visiting and trying to capture the shots though. Fascinating historical story that your children will cherish. Aw, thanks, Paulette! I hope your pooches are doing as best they can. This is an amazing recreation of an earlier time. What time it must have taken to get the pictures aligned just right. I am impressed! If you did something wrong I cannot see it. Perfect proportions are not needed here–just a juxtaposition that shows the pictures were taken at the same place, and on a similar if not exact scale. I have never seen this done before so it is exciting to see it. I remember buying a postcard in Cologne, Germany that showed the modern city on one half and the bombed out shell of a city (ca. 1945) on the other, with just the Dom (cathedral) left standing. The point of view was the same. But that didn’t have the emotional impact of the pictures in your post. Yours were personal and made me think of vanished relatives and memories in my own family, and times that will disappear utterly when those of us who remember are gone. You bring life to something very special, so don’t be too hard on the technical aspects of your pictures. It’s hard for a photographer to do, but as a writer, you hit a home run. Thank you so much, Jeannie. That made me feel good! Koji I love this. I am so impressed with your desire to know your history, be a part of your present, and preserve both for the future. Connecting them all. Your family will definitely appreciate this! I hope they do! Thank you! Cool project nevertheless. The one of Mt. Rainier was pretty good. Thank you! Stumbling across the suitable location on Rainier was pure luck! A lot of time and effort went in to finding all these locations. A testament to how smart you are to be able to piece this together. Awesome post! Aw, thanks, Punkie! I do wish I could go back and reshoot, though. Maybe you will! What a lovely project with some great results. Koji, I’m certain your relatives will cherish these treasures and save them for your future generations. That would be outstanding!! You are such a great friend!! I don’t know how to thank you. When the Japanese paratroopers dropped on the airport, Smitty was there, maybe one day I see it…. I hope you will, gpcox. Which airport was it? Tacloban, Dulag or Burauen? The Burauen area, ~ 60 landed on the Buri strip and about 300 for the San Pablo airstrip. The planes headed to Tacloban were shot down and one plane headed to Dulag crash landed. Yes, you always learn a lot in retrospect in photography. Even so, I would be really proud if I had created photographs as good as the ones you have achieved here. Sir, that was very kind of you to say so. I appreciate it very much. WOW OMG these photos should be in the museum. Wonderful work ! Haha if only cakes don’t rot ! …and thank you for your visit! Fascinating! Your blog always is a treat to read and to think about. No matter how successful you feel you weren’t in some instances, all of these photos stand up to the task, and place your family squarely where they were and are. It’s a beautiful record of a time and a people! Thank you, good sir. I appreciate your thoughts immensely. You are so lucky to have these photographs. …and you, Wayne’s diary! That is a precious heirloom, sir. Thank you. I’m glad I read all your reasons the reconstructions were no good after I had studied them, because I thought they were brilliant. I love grandmother Kono’s hat in the first shot. No matter what you say, Koji, these are fantastic! I absolutely love how you pieced these together. Amazing! That 1918 photo of your aunt and uncle is adorable! That’s very kind of you, Linda. Thank you! Thank you, Debra. You are also too kind. I really wish I could just drive back to that corner sans the kids on a Sunday and take my time re-shooting. Fascinating! You inspire me to do a similar project here for my clan. Glad I met you!